Zombies And Toys: More Zombie Toys! 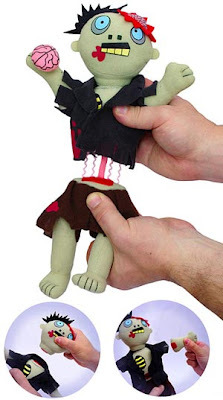 I just re-stocked some zombie toys! I'll try and post some first-hand pics this weekend. All individual prices include shipping. If you are interested in purchasing multiple items, shoot me an email letting me know what you are looking to grab and I'll get back to you with a combined shipping rate. 4 sets or more just $5 shipped per set! Zillions of mutated bodies infecting everyone! Meet School Girl, Rockabilly, Bathtime, School Boy, and the Ape! 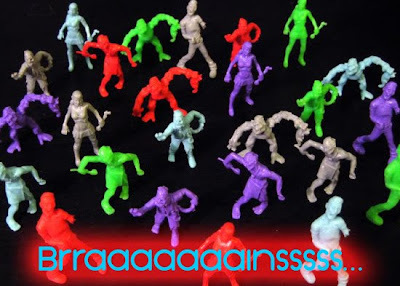 These flesh eating fiends are about 2" tall and each set of seven figures inlcudes toxic green, pale blue, glow-in-the-dark, white and New blood red, purple & grey. 2 or more just $20 shipped each! 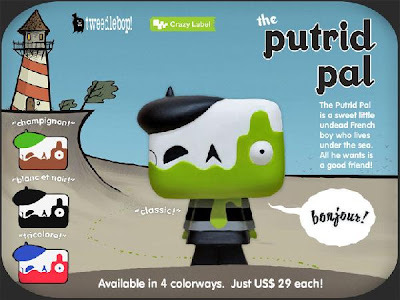 The Putrid Pal is an undead French boy who lives under the sea. He just wants a good friend to play with, but none of the non-monster kids of Woe Beach want to have anything to do with him. He grunts out single words from time to time, only in French. Edition of 300 for each color Classic, Champignon, Blanc et Noir and Tricolore. entire set of 3 for $175 (shipped)! P CREATIONS LTD. from Japan presents 3 great new vinyls designed by TSUCHIYA SHOBU (apollo inc. - Japan). Each character Bone, Mummy, and Mosquito are between 8 and 10 inches tall and comes with their own skateboard in full color window box. Thanks. The store will continue to grow as long as interest remains. Glad you like the prices! I'm not trying to get rich. I just want to offer great zombie items at the most affordable price. Or, at least, reasonable based on what it is. I may know the answer to this.. but are you shipping internationally for the toys? Sure, I'll ship internationally. Of course, the stated prices will not be the same due to shipping. Shoot me an email at zombiesandtoys@gmail.com with your address and what you're interested in and I'll send you a quote. There are Zombie skateboards now at Toys R Us made by Last Exit. They are sooooo cool!